Israeli security forces are questioning 10 Hamas terrorism suspects, including four Hamas legislative council members, who were arrested in overnight raids across the West Bank, the military said Thursday. “These men have been the leaders of the ongoing effort to restore the administrative branch of the Hamas terror organization in the region, while attempting to strengthen the power and influence of Hamas,” an Israel Defense Forces statement said. Another 10 Palestinians also were taken into custody. Hamas is an Islamic militant group that has ruled Gaza since 2007, while the rival Fatah faction controls the West Bank section of the Palestinian territories. At a news conference following the arrests, Hamas legislator Mushir al-Masri warned current and future leaders of the Israeli government that if such escalations continue, Israelis could pay the price. He didn’t elaborate. He also suggested that the case of kidnapped Israeli soldier Gilad Shalit could be permanently closed, apparently indicating a possibility that negotiations for Shalit’s release could end. Palestinian militants, including some linked to Hamas, crossed into Israel from Gaza in June 2006 and kidnapped Shalit, then 19. Talks on his release have started and stalled many times — with the most recent round, mediated by Egypt, collapsing Tuesday when the Israeli Cabinet rejected the latest Hamas demands. Israeli Prime Minister Ehud Olmert has been criticized for failing to bring the soldier home. 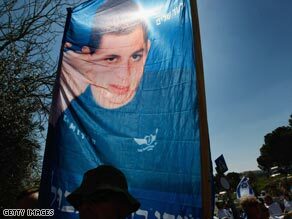 On Tuesday, Olmert said that attempts to secure Shalit’s release would not end, but he blamed Hamas for reneging on earlier agreements and “hardening” its position with “extreme demands.” Hamas spokesman Ayman Taha said his group holds Israel responsible for the collapse of the latest prisoner exchange deal. Hamas has demanded that Israel release hundreds of prisoners. Israel responded that many prisoners Hamas wants released were behind terrorist attacks that killed Israeli civilians and they will not be released.